Oysters are any of a number of distinct groups of bivalve molluscs which live in marine or brackish habitats. The valves are highly calcified. 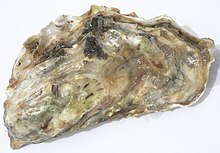 Some kinds of oyster are commonly consumed by humans, cooked or raw. These are considered an aphrodisiac. Others, such as pearl oysters, are not. Author unknown; reported in Jacob M. Braude, Braude's Source Book for Speakers and Writers (1968), p. 14; Respectfully Quoted: A Dictionary of Quotations (1989). Samuel Butler, Dyet's Dry Dinner (1599). William Cowper, The Poet, the Oyster and Sensitive Plant; reported in Hoyt's New Cyclopedia Of Practical Quotations (1922), p. 575. Charles Dickens, A Christmas Carol (1843), Stave I. "It's a wery remarkable circumstance, sir," said Sam, "that poverty and oysters always seem to go together." Charles Dickens, Pickwick Papers (1836), Chapter XXII. William Shakespeare, Much Ado About Nothing (1598-99), Act II, scene 3, line 20. Richard Brinsley Sheridan, The Critic, A Tragedy Rehearsed (1779), Act III, scene 1.